Former chief secretary Anson Chan joins a rally on Sunday calling for immediate release of missing bookseller Lee Bo. Chan urges Chief Executive to defend Hong Kong's systems. After a brief break with no new developments at the end of last week, the missing bookseller saga saw fresh drama on Saturday with new claims of “reappearance” of shareholder Lee Bo on the eve of a rally in clamouring for his immediate release. The letter did not carry information about to whom Lee wrote. In the letter, he said: “Your behaviours have already severely disrupted the daily lives of me and my family, we are under great pressure and feel mentally and physically exhausted. How could I return to Hong Kong in such atmosphere? The “leave-me-alone” appeal came on the eve of a rally organised by the Hong Kong Alliance in Support of the Patriotic Democratic Movement in China yesterday. 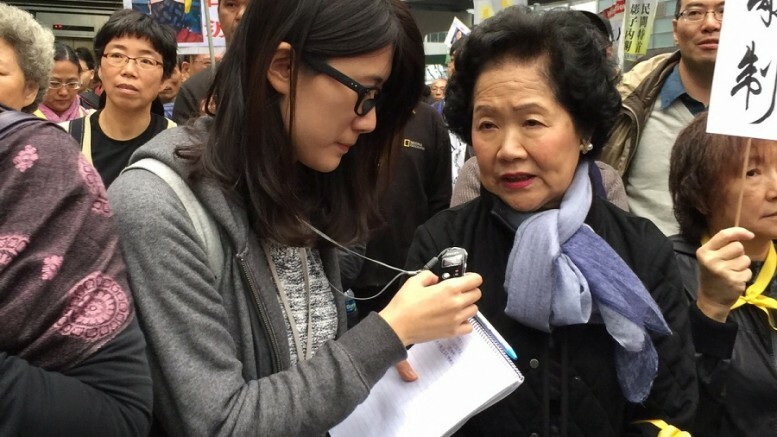 More than 6,000 people, including prominent democrats such as former chief secretary Anson Chan Fang On-sang, joined the march from the Government Headquarters to the Central Government’s Liaison Office in Western District. It also came as major Western countries echoed concerns about the implications of the case and said they were closely monitoring the developments. The plea purportedly made by Lee for “everyone”, presumably included the Government, not to “make a big deal” has raised questions about the Government’s role, if any, in the case. That question has indeed been raised when Lee wrote in another letter to his friend he has returned to the mainland “in his own way.” Government sources told the media they have no record of Lee leaving the city. Any ordinary citizens would have come to their governments for assistance if they run into trouble. That seems not to be so in the Lee Bo case. Lee seems to have decided to tackle his problems on his own, without going through the Government. It is unclear whether that is a decision made by himself or imposed by “powerful agencies” as the semi-official Global Times has alluded to in an editorial last week. Responding to fresh enquiries on Sunday, the Government could only reiterate they have written to the mainland authorities for assistance. Their calls have apparently been ignored. The Government said they would continue to urge the relevant authorities to give an early reply. Also on Sunday, two key pro-establishment figures have joined calls for the relevant authorities and persons and the police to give an early account to help dispel public jitters. Legislative Council President Tsang Yok-sing said the Hong Kong and central governments should make joint efforts to ease public concerns. Almost two weeks after Lee’s wife reported to the police of Lee’s disappearance, the Chinese Government has not given any official comment. The Foreign Ministry reiterated they knew nothing about the case. Just as the mystery surrounding the whereabouts of Lee, the “disappearance” of the Hong Kong and mainland governments in the missing booksellers case is equally baffling and scary to many Hongkongers, wondering what happened to the “one country, two systems” policy. Be the first to comment on "Governments go missing in missing bookseller saga"